In construction of quadrilaterals we will learn how to construct a quadrilateral. We know that a quadrilateral has ten parts in all: four sides, four angles and two diagonals. To construct a quadrilateral, we shall need data about five specified parts of it. We consider the following five cases and explain the construction in each case by an example. We divide the required quadrilateral into two triangles which can be easily constructed. These two triangles together will form a quadrilateral. 1. 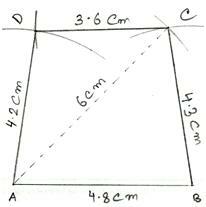 Construct a quadrilateral ABCD in which AB = 4.8 cm, BC = 4.3 cm, CD = 3.6 cm, AD = 4.2 cm and diagonal AC = 6 cm. 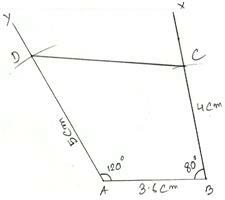 First we draw a rough sketch of quadrilateral ABCD and write down its dimensions, as shown. Step 1: Draw AB = 4.8 cm. Step 2: With A as center and radius equal to 6 cm, draw an arc. Step 3: With B as center and radius equal to 4.3 cm, draw another arc, cutting the previous arc at C.
Step 5: With A as center and radius equal to 4.2 cm, draw an arc. Step 6: With C as center and radius equal to 3.6 cm, draw another arc, cutting the previous arc at D.
Step 7: Join AD and CD. Then, ABCD is the required quadrilateral. 2. 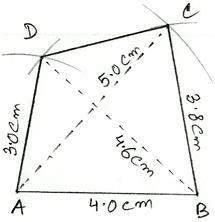 Construct a quadrilateral ABCD in which AB = 4 cm BC = 3.8 cm, AD = 3 cm, diagonal AC = 5 cm and diagonal BD = 4.6 cm. Step 1: Draw AB = 4 cm. Step 2: With A as center and radius equal to 5 cm, draw an arc. Step 3: With B as center and radius equal to 3.8 cm, draw another arc, cutting the previous arc at C.
Step 5: With A as center and radius equal to 3 cm, draw an arc. Step 6: With B as center and radius equal to 4.6 cm draw another arc, cutting the previous arc at D.
3. 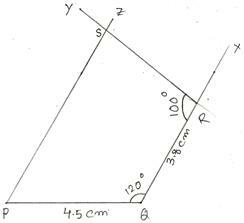 Construct a quadrilateral ABCD in which AB = 3.6 cm, ∠ABC = 80°, BC = 4 cm, ∠BAD = 120° and AD = 5 cm. Step 1: Draw AB = 3.6 cm. Step 2: Make ∠ABX = 80°. Step 3: With B as center and radius equal to 4 cm, draw an arc, cutting BX at C.
Step 4: Make ∠BAY = 120°. Step 5: With A as center and 5 cm as radius, draw an arc, cutting AY at D. Step 6: Join CD. 4. Construct a quadrilateral PQRS in which PQ = 4.5 cm ∠PQR = 120°, QR = 3.8 cm, ∠QRS = 100° and ∠QPS = 60°. 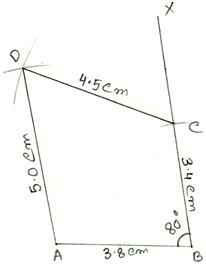 First we draw a rough sketch of quadrilateral PQRS and write down its dimensions, as shown. Step 1: Draw PQ = 4.5 cm. Step 2: Make ∠PQX = 120°. Step 3: With Q as center and radius 3.8 cm, draw an arc, cutting QX at R. Join QR. Step 4: Make ∠QRY = 100°. Step 5: ∠QPZ = 60° so that PZ and RY intersect each other at the point S.
Then, PQRS is the required quadrilateral. 5. Construct a quadrilateral ABCD in which AB = 3.8 cm, BC = 3.4cm, CD = 4.5 cm, AD = 5cm and ∠B = 80°. Step 1: Draw AB = 3.8 cm. Step 3: From B, set off BC = 3.4 cm. Step 4: With A as center and radius equal to 5 cm draw an arc. Step 5: With C as center and radius equal to 4.5 cm, draw another arc, cutting the previous arc at D.
Step 5: Join AD and CD. Then ABCD is the required quadrilateral.